Side toolboxes, across-the-bed toolboxes, Carry-Alls and 3 spool valves are a few of the Krogmann extras that set this Kansas manufacturer apart from other bale handling equipment companies. 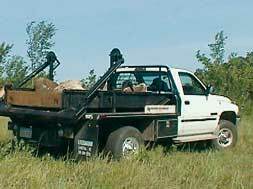 Carry-All for balebeds haul heavy rock, sand or dirt. Firewood, posts and brush are easy to load, haul and dump with the Krogmann Carry-All. Carry-All for balebed trucks haul rock, sand, dirt, firewood, posts and brush. Same equipment will load and transport your 4-wheeler, mower, etc. Lift and load up to 2,000 lbs. Haul and dump loads up to 4,000 lbs. from the comfort of your pickup cab using a Krogmann Carry-All. Carry-Alls are available to fit most balebeds. Constructed of heavy-duty steel with undercarriage support. Easily load and unload by setting the Carry-All on the ground. Cradle and carry your 4-wheeler, mower, etc. 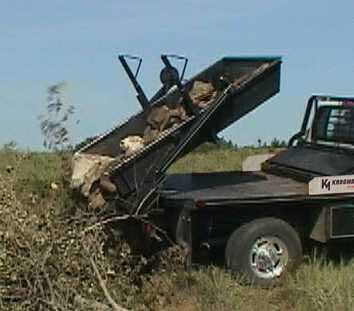 Use to haul rock, sand, dirt, firewood, posts and brush. Dumps easily by changing to the dump position from the controls in your cab. 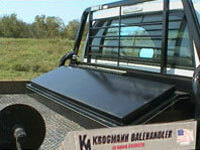 Patent pending Krogmann design is also compatible with other brands of balebeds. Easy-to-load and haul 4-wheeler, mower and small equipment with hydraulic dump box for flatbed trucks. 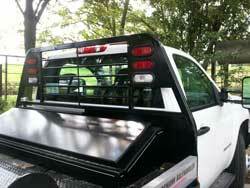 Toolbox for flatbed truck bed. 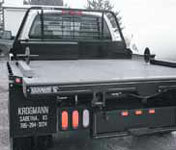 Optional underbody Side Toolboxes available. The Best Quality Balebeds, Carry-Alls and Toolboxes since 1989. Email us at: or call toll-free 877-745-3783 with questions/comments, for the dealer nearest you or for current price information.